About 19 Tamil Tigers and a soldier were reported dead after the latest clashes between the two sides in northern Sri Lanka. After the latest military operations, the pro-government troops captured a key LTTE base as well as two defense lines in the region, the Army informed on Sunday. 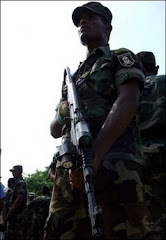 ''During Saturday's military advance into non-liberated territory ahead of Wanni defenses, security forces overran what was identified to be the LTTE's 'Vietnam base' located at general area of Periyapunichankulama,'' the Defense Ministry said for NDTV.com. The statement also informed that the government troops managed to move one kilometer on Saturday into the entry-exit pass at Uiylankulam in Mannar-Vavuniya border. The maneuver forced the LTTE rebel fighters to retreat. As several clashes took place, the government troops destroyed ten rebel bunkers and killed eight militants and injuring 14 others in the process, the military reported. One soldier was also reported killed in combat. Another conflict occurred at Nagarkovil defence line in Jaffna, where troops engaged in heavy mortar and artillery barrages on Sunday. The clash ended with another four LTTE bunkers being destroyed and at least eight rebels shot dead, the statement said. The Liberation Tigers of Tamil Eelam wrote in their website about the latest clashed with government troops, but the facts were totally different. The web site said the separatist fighters repelled the offensive in Mannar and that 17 government soldiers had been killed and 54 injured in the fire exchange. There were three casualties among the LTTE fighters, the web site said.